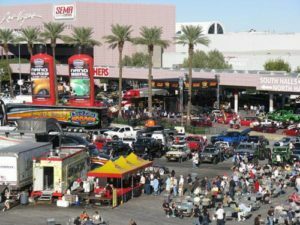 From wheel covers to spray paint applicators, just about anything you could want for your car was on display at the SEMA Show in Las Vegas. Promoters bill it as the “World’s largest collection of Automotive innovation,” and they are right. More than 2,200 new products were showcased, and as many as 60,000 buyers and dealers were on hand to discover those products. Awards were given in 16 categories, which highlighted the most outstanding products, but there were a lot of other products that had automotive dealers drooling. Attendees were given a hand-held scanner to carry around to the various exhibits. They scanned items they were interested in and turned the scanners in before leaving. They were then given a printout of items they had scanned, along with information on contacting the company producing the item. Some of the products shown are on the market already, while others are to be available soon. Among the winners was the 3M Company, which won the Best New Collision Repair and Refinish Product, for its new spray gun that allows undercoating and paint to be applied in uneven areas more efficiently. Using ink-jet type technology, the product allows the spray to be spread more evenly and more precisely than what is normally available. The Best Engineered New Product went to Viking Performance for its shock absorbers that can adjust 1,000 times per second to road conditions to give a more comfortable ride. The Best New Interior Accessory Product was one that improved what is already there. Nearly all cars have gauges on the dashboard, but with the new Palmer Performance Engineering system, a person can add a lot of other instruments easily. Their product is a system of several gauges and instruments that can be easily plugged into a OBD-II port using plug and play technology. Continuing the electronic theme, AutoTrickz won the Best New Van/Pickup/ Sport-Utility Product award. Their product allows keyless entry for vehicles not made with that capability. The product is a stick-on numerical keypad that can be put on the inside of a vehicle window. The car owner can have a code to put in by tapping on the keypad from the outside, to open a vehicle. The Best New Tool Award went to Leap Innovators for their electronic trailer hitch scale that allows people to get the tongue weight when hooking up for towing. ← Gas Prices are Dropping – What Does it Mean?